As a member of the Artisan and Fellow Selection Committees, I’ve heard that statement a few times. 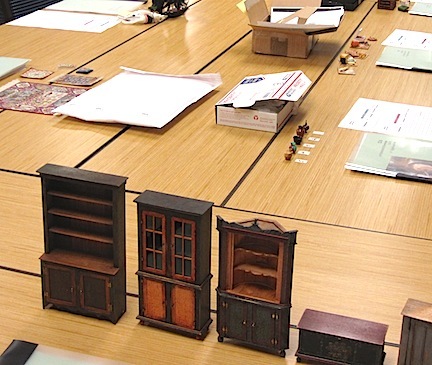 Many who utter it are looking for some tips on the process, or encouragement to take that leap; its an admirable goal, especially for those who are interested in the constant process of refining their skills making miniatures. A group of submissions is set out and ready for evaluations. The best advice I can give to prospective applicants is to use your eyes. First, use them to read all the information that is posted on the IGMA website on the application process and read the guidelines. Keeping the guidelines in mind, examine your work, is it compliant with the guidelines? Secondly, look at work around you-if you can get to shows, find the best work there and note what about it makes it the best. If you have no access to great miniature work first hand, look at great full-size work, the only difference will be the scale, but you can see how the proportions work for the elements of each piece, if its furniture, how the various pieces fit together, how thick or glossy is the finish, is your work as clean and neat, just proportionally smaller-in proper scale? As for the process, it goes like this: the committees meet once a year following a schedule set out on the IGMA website. You must notify the committee chairperson or the Guild Administrator by the stated deadline of your intention to apply. The notification allows the committee to estimate the amount of time they’ll need for evaluations. This is not an absolute commitment, so let them know even if you’re not sure you’ll be ready in time, it is much better to drop out, than to ask to be included at the last minute and find that the committee will not have time to evaluate your submission. You must then submit your pieces with the accompanying paperwork within the time frame. The committee chair persons receive all submissions and prepare them for evaluations, this includes removing any and all traces of the submitters names so that the process can be completely blind. This is our, and your, assurance that the process is as fair and impartial as it can be. Without knowing whose work is being evaluated no one brings any preconceived notions to the table-either favorable or unfavorable, the work is judged on its merits alone. 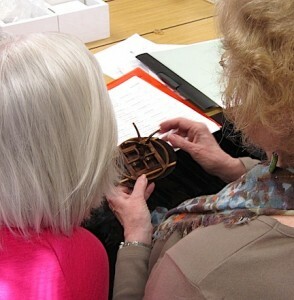 Julie Stevens and Phyllis Hawkes examine the construction details on a submission. On the day of evaluations, the chairperson lays out the work on large tables-depending on how many submissions there are, there could be as many as 10 or 12 submissions laid out at one time. Each submission has its own dedicated space, with its documentation and comments sheets. This allows the 8-10 people on the committee to work at the same time, and at their own pace, moving from submission to submission as they are ready. Each committee member reads the supporting materials submitted, studies the work and scores it based on criteria that have been established over many years, overall presentation, workmanship and difficulty. People work at different rates, and the process can be lengthy; 20 submissions can easily take an entire day to evaluate! Use of magnifiers and rulers are encouraged so that no one just assumes the scale is correct. It is also not unusual for committee member to take advantage of the hotels wi-fi to look up and check on the accuracy of details. Applicants are continually encouraged to document their work and provide supplementary information on the pieces that have inspired them. If you submit an ear of corn that, in scale would be 15″ long, you had better supply the committee with photos of real size corn that is 15″ long, otherwise they will assume that your corn is out of scale having no experience of corn of that size! When everyone has finished evaluating each submission, the chairperson takes a vote, just pass or fail, on each submission. If the decision is pretty unanimous, it ends there for that submission. If the vote is at all close, the chairperson asks for the actual scores and the numbers are averaged, if a passing number is reached, the submission passes. After the entire process is completed, the chairperson lets the committee know whose work they have been evaluating. The list of names that the committee has approved for Artisan membership then goes to the full board of trustees for approval and the process is done for another year.